Between late April and late May, the brilliant Palestinian cartoon artist Mohammad Sabaaneh took his message about the inhumane effects of Israel’s rule over the Palestinians to two dozen audiences in 15 cities all around the United States. 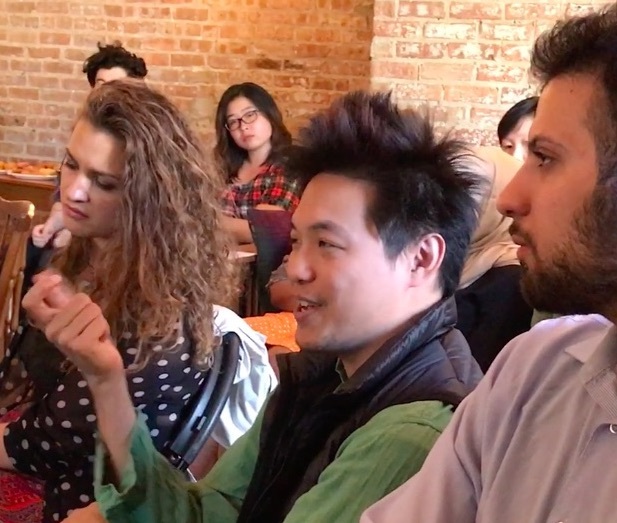 Just World Educational was proud to work with partner organizations all across the country to bring Sabaaneh to audiences in a wide variety of venues, including college classrooms, bookstores, community spaces, at least one church, a Muslim community center, and artists’ gatherings. Our big appreciation and thanks to all our partner organizations, and the numerous social-justice activists and volunteers whose work they count on! 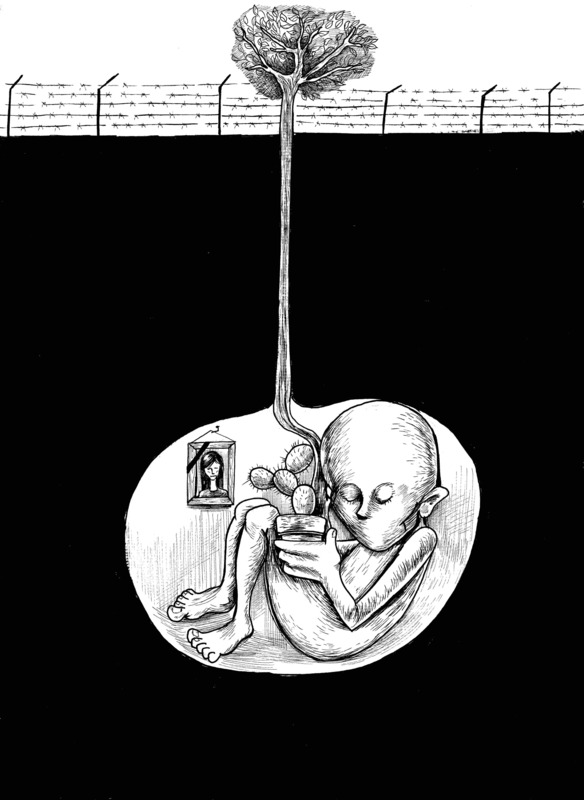 Sabaaneh’s tour had the formal title “Life and Prison in Palestine: A Cartoonist’s Eye”. We shared earlier reports of it here and here. 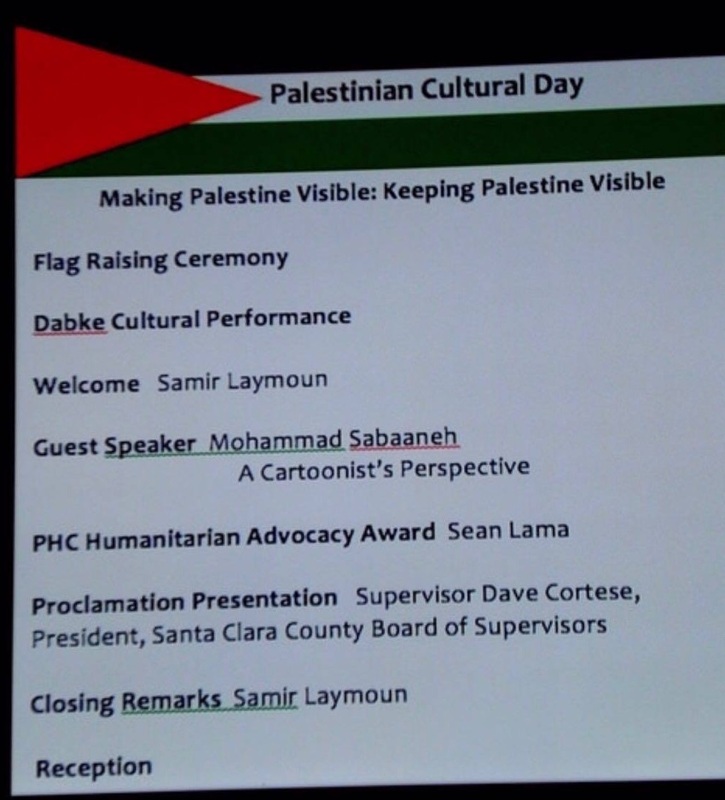 That second report left Sabaaneh in San Francisco… After that, he spoke at Stanford University in Palo Alto; at two venues in the Greater Los Angeles area; in Santa Clara County, CA; at three venues in the Chicago area; in Detroit; at two events inManhattan: and one each in Baltimore and Philadelphia. Sabaaneh’s testimony was all the more powerful, because he was speaking during the period when more than 1,500 of the Palestinian political prisoners held in Israel’s jails were on hunger strike in protest at their conditions. Four years ago, Sabaaneh himself was imprisoned by the Israelis for five months. The two weeks he spent in solitary confinement in that period were transformational: It was during that time he decided he should compile his art into a book for world audiences. That book, White and Black: Political Art from Palestine, was published in early May by Just World Books. Its release provided the occasion for the US tour. The two dozen audiences who got the chance to hear the poignant message that Sabaaneh shared in his presentations were deeply moved. At each event, the slide presentation he gave was followed by a lively period of interaction with audience members. 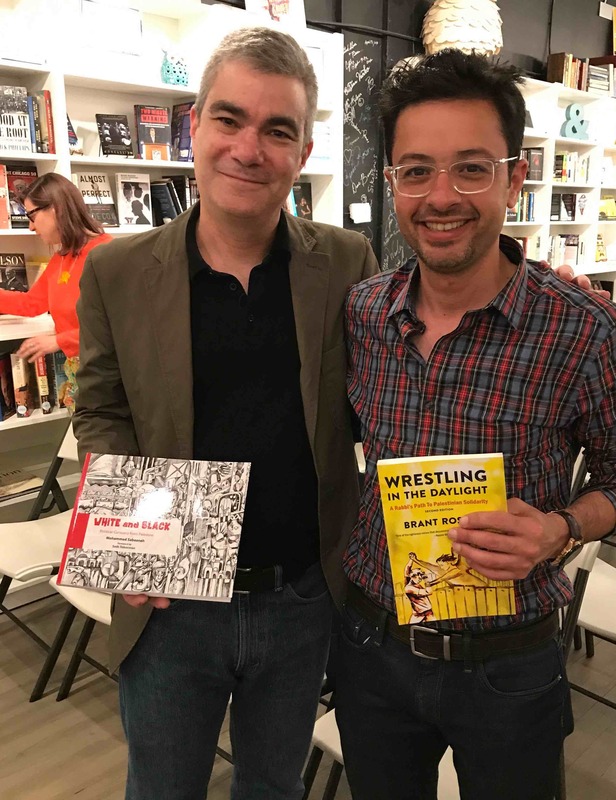 In Chicago, Sabaaneh got to meet in person for the first time with Ali Abunimah and Maureen Murphy of Electronic Intifada– a publication to which he used to contribute and which in early May published this very thoughtful review of his book. 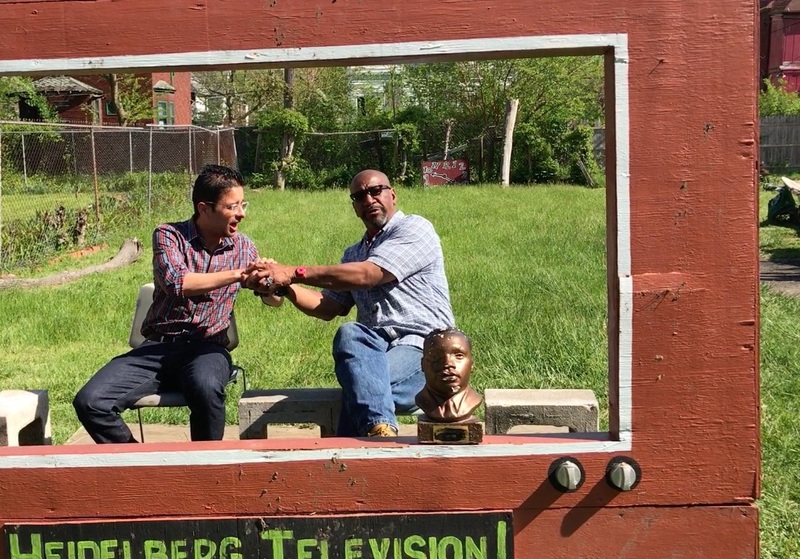 In Baltimore, he sat down for an in-depth interview with Sharmini Peries of The Real News Network, which later aired the great, 14-minute report of their conversation. We are still trying to process the many different records created from the tour! There are over 100 photos from the tour in the Tour Album that Just World Books put up on their Facebook page… But they still need a bit more organizing, captioning, and tagging… There are three videos of varying quality, from the tour, on the Just World Books Youtube channel. And we really love this interview with Sabaaneh that Lucy Duncan of the American Friends Service Committee put up on their website. If you have any photos, video, blog posts, media write-ups or any other records from the tour that you’d like to share– please send them to our Outreach Director, Steve Fake, as soon as possible! And finally, again, our big “THANK YOU!” to everyone around the United States who helped to make this such a great tour!